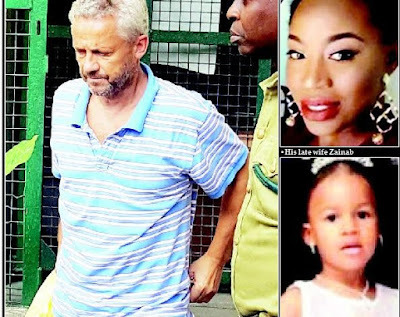 A Yaba Chief Magistrates’ Court, Lagos yesterday remanded a Danish citizen, Peter Nielsen, suspected of killing his wife, Zainab Nielsen, and their three-and-a-half-year-old daughter, Petra. Asuquo tendered a three-page application, containing 15 grounds for the Nielsen’s remand. Asuquo said: “He took the lifeless little girl and put her under the mother’s body and then put on gas stove burners in the kitchen so that it will be believed that the wife and daughter were suffocated to death by the cooking gas. Last year, Zainab, alias Alizee, signed a two-year record deal with an Asian record label, Petra Entertainment. The deal reportedly earned the Kogi State native a new Ford explorer SUV, a house on Banana Island and international distribution with affiliates of her record company in Asia. In January, she released a single, ‘Alhaji Musa’.